In 2014, I was honored to be a finalist in the Emerging Author category. 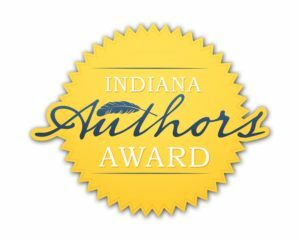 I traveled to Indianapolis for the awards event, which included a live appearance at the library in addition to the awards dinner. 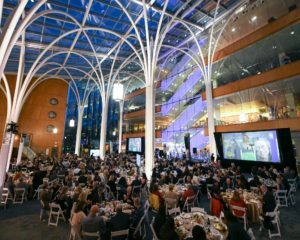 In order to provide greater exposure to emerging authors, the library names three finalists in that category, so that all three come to the event without knowing who will win, whereas the national and regional winners are announced in advance. For the Emerging Author finalists, at least, there’s agonizing suspense as the winner isn’t announced until the very end of the program—over dessert. Because there is a nice trophy and a cash prize, plus a grant to an Indiana library of the winner’s choosing, it’s a pretty big deal. In 2015, I was a finalist again! Because of Kelsey’s experience, I was hopeful that the second time would be the charm for me and I again went to Indianapolis for the awards dinner. Happily, over dessert, I was named the winner. It was a wonderful evening and I was thrilled to win. (I was interviewed immediately after the dinner and you can see the video here. This year, all the past winners were invited to return for the awards dinner to celebrate the 10th Anniversary of the event. I went (this time I drove, thanks to some airline problems), and was pleased to see many people I knew from my two previous award dinners at the library, plus several past winners I had not met before (including John Green, bestselling author of The Fault In Our Stars, who kindly provided an autograph for my niece, who is a big fan). This time, I was much more relaxed, since I was not up for an award. I didn’t have to worry about giving an acceptance speech or being photographed (although there was a photographer present and I’m sure I showed up in a few of the pictures she took). Here is a picture of the dinner in progress – I can see the back of my head at a table near the front. The evening concluded with a surprise announcement from The Glick Fund who had sponsored the event from the beginning. There will be no awards given in 2019, as they take time to reassess the program, but will come back with a redesigned awards program in 2020. Although it’s unfortunate that the awards will be on hiatus next year, it’s great that they are coming back. Awards like this do a great deal to promote reading and encourage writers, both of which are important objectives.